A new survey from NRG paints a bleak picture for the embattled service MoviePass. It's amazing what a few months can do. The last time the National Research Group surveyed MoviePass the company scored an 83% on the customer satisfaction front, but in the latest survey that has sunk down to 48%, but that isn't the most damning stat, unfortunately, as around half of those surveyed (47% to be exact) are thinking of cancelling their membership entirely (via THR). The survey says that 47% "indicated they are very or somewhat likely to cancel their membership following the recent changes." The survey also states that 50% of those who canceled their MoviePass subscriptions did so in the month prior to the survey, so it seems MoviePass has already started losing significant customers. 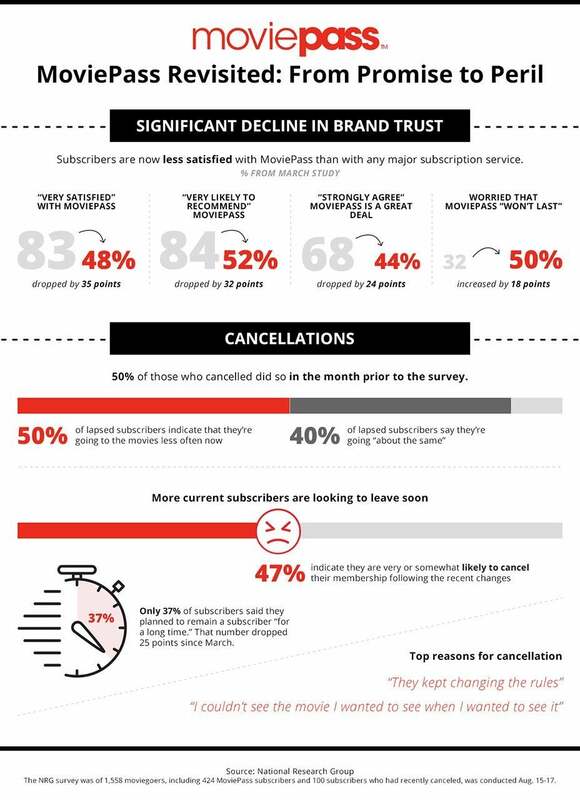 Other notes include that "only 37% of subscribers said they planned to remain a subscriber for a long time", a number that has dropped 25 points since March of this year. As for the reasons people are canceling or thinking of canceling, the top reasons listed include "they kept changing the rules" and "I couldn't see the movie I wanted to see when I wanted to see it", which are two big issues with the service in the last few months. Penn also pointed out the potential the service has, but whatever service will take advantage of it will need more than anything stability. The survey bolsters that argument a bit, as the survey says "50% of lapsed subscribers indicate that they're going to the movies less often now", though 40% say they are going "about the same". MoviePass recently rolled out plans for a stable change to its formula, as it will allow three movies per month at a $14.95 price point, but the constant fluctuations have hurt the brand in customers eyes. We'll have to wait and see if the service can rebound with its new plan before all of its subscribers are gone.